This hour-and-seventeen-minute music video compilation provides the complete sequence of 8 individual "chakra balancing" videos for total spiritual energy rebalancing. There are brief intermissions between each therapeutic segment, presented individually in the 8 video Frequency Rehab Program. These music-videos were composed and produced by the pioneer of the modern therapeutic uses of the ancient original Solfeggio musical scale, Dr. Leonard G. Horowitz. Dr. Horowitz's myriad works have evolved healthcare beyond the "drug paradigm." His Frequency Rehab Program multimedia set of eight individual videos is VERY POWERFUL, and can be purchased or rented separately by clicking HERE. This complete SOLFEGGIO ECLECTICA MUSIC VIDEO THERAPY PROGRAM is designed to be used by individuals who suffer from myriad illnesses that Dr. Horowitz claims are fundamentally caused by bio-energy imbalances, "chakra blockages" or imbalances, affecting acupuncture meridians and spiritual "healing crises." People seeking natural alternatives to costly and risky drug therapies and vaccines are wise to gain and use this alternative approach to healthcare based on extensive science reviewed by Dr. Horowitz in several books, including The Book of 528: Prosperity Key of LOVE. 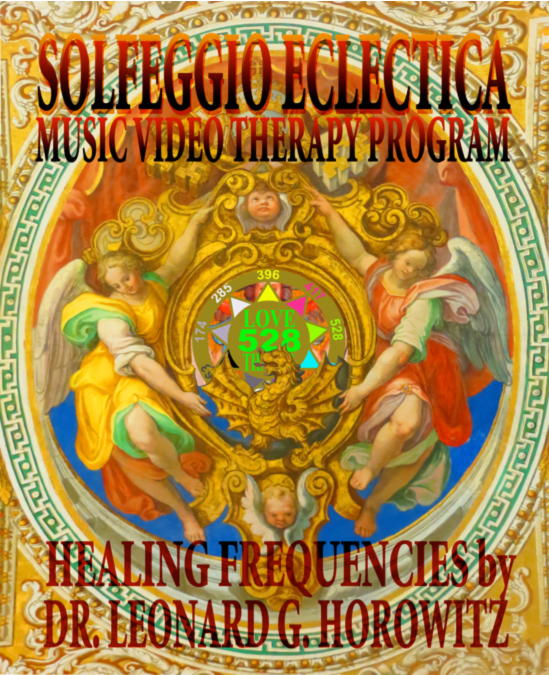 The Frequency Rehab Program, or this complete SOLFEGGIO ECLECTICA MUSIC VIDEO THERAPY PROGRAM that plays all eight (8) videos in sequence (without clicking each individual video) is ideal for community activity directors and therapists of all kinds working in healthcare to help patients, clients, or residents in communities (or also members of religious groups hosting special healing events) gain tremendous benefits from balancing and freeing their chakra vortex centers and acupuncture energy meridians. The 50-page Solfeggio Eclectica Guidebook by Dr. Horowitz explaining this technology is included in this purchase in a downloadable PDF file format. This long-playing music video addresses each of the seven known chakra energy centers sequentially, beginning with two "root chakra" videos exercising the 396Hz and 417Hz Solfeggio frequencies first used in the Hymn to St. John the Baptist. These chakra-balancing frequencies are central to nature, and the musical-mathematical matrix of "Divine-design" (or "intelligent design") generally accepted in physics and in Oriental medicine. Dr. Horowitz equates the "Holy Spirit" recognized by all religions with the natural "prana" or "chi" energy honored in traditional Asian cultures. World leading physicists and mathematicians have also confirmed the "matrix math" upon which "sacred geometry" and organic chemistry is based involving these special Solfeggio frequencies. This complete SOLFEGGIO ECLECTICA MUSIC VIDEO THERAPY PROGRAM facilitates recovery of the powerful "Holy Spirit Flow" of energy responsible for healing ailments of the body, mind, emotions, and spirit most naturally. Viewers can enjoy these production either in bed, sitting comfortably, or moving, exercising, or "ecstatic dancing" to each of the chakra balancing productions. This is, therefore, wonderful, uplifting, and healing personal and/or group activity. To read and understand more about Dr. Horowitz's wonderful production, click HERE. Click the button below to add the SOLFEGGIO FREQUENCY MUSIC VIDEO THERAPY PROGRAM (8 videos) to your wish list.